Lilly Pulitzer for Target aka My Dream Come True! 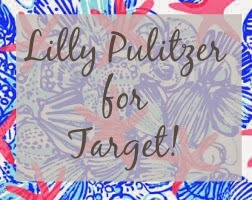 Is anyone else just as excited as me for the Lilly Pulitzer launch with Target this Sunday!? I for one will be anxiously waiting outside of Target at 7 AM this Sunday to be sure to score some cute stuff for this Summer! The best part about the launch is that everything listed above ranges anywhere from $8.00 to $50.00! Can you believe it!? Me either! I wonder what Lilly Pulitzer herself would think of this collaboration? Will you be heading to your local Target this Sunday? Welcome! My name is Kristen and I am a beach and coffee lover. Follow along as I share a glimpse into my life with you!